Texas’ new “Show Me Your Papers” Law, Senate Bill 4 (SB4), goes into effect on September 1, 2017. Understandably, many foreign nationals and U.S. citizens alike worry about how it will affect their loved ones. I often receive anxious questions like this: “What will happen if my husband is pulled over? What happens if my wife gets arrested? What do I say when I am asked questions?” Let me explain a bit about SB4 and hopefully allay some of your fears. The key concern of SB4 is that it requires local law enforcement agencies that have custody of individuals to comply with all federal immigration detainer requests. A detainer request, usually issued by Immigration and Customs Enforcement (ICE), is a written request that a local law enforcement agency holds an individual for more time after their original release date to provide ICE agents more time to decide whether or not to put the individual into federal custody for removal. In other words, if your local law enforcement agency receives a request from ICE to detain you longer, they MUST comply. Examples of local law enforcement agencies include the city’s police department, campus police, and the sheriff’s department. No longer will these local entities be able to refuse cooperation and keep individuals out of jail. Officials may even be removed from their positions if they do not comply with SB4. What should I do if I am stopped by police while walking down the street? Many people don’t know that you have the right to walk away in this situation. Or, you may ask the officer “Am I free to leave?” If the officer doesn’t stop you, then walk away. If for some reason you believe you are free to leave and the officer is violating your rights, do not fight. It’s safer to cooperate and then seek legal action later. What happens if I am pulled over in my vehicle? I am asked this question most often. Of course, do not be argumentative with the police officer and pull over to a safe area. When asked to present your driver’s license, registration, or proof of insurance, do so politely. The officer may ask to search your car. As long as there is no evidence of a crime in your car, you can refuse a search. What if they end up arresting me? Again, do not run away or otherwise resist arrest. Disclose your name, address and birthday. After that, you may want to remain silent or declare “I am exercising my right to remain silent” and do not speak after that. Officers may use what you say against you in court, so exercising your right to remain silent may be one of the most helpful things you can do. The exception to this general rule is that you can ask for a lawyer. Or, you can use your one phone call from jail to call a trusted family member who can then call an immigration lawyer for help. Law enforcement officers are not allowed to listen to the call if you call a lawyer. While you are detained, don’t discuss your immigration status with anyone but your lawyer. Officers may visit you in jail but you don’t have to answer or sign anything you don’t understand. Can’t I just lie about the fact that I do not have permission to be here? NO. By lying about your immigration status, you are risking making a false representation about yourself or even a false claim to U.S. citizenship–the kiss of death for aspiring immigrants. However, you don’t have to answer questions about your immigration status. Again, you may exercise your right to remain silent. It is best to speak to an immigration lawyer before answering any questions about your status. You don’t want something you say to come back to haunt you. What if I am in the U.S. on a visa (i.e. with permission)? Do I have to tell the officers this? If you are in the U.S. on a visa, you MUST disclose your immigration status if you are asked by a FEDERAL immigration officer. This means an officer from Immigration & Customs Enforcement (ICE), Customs & Border Protection (CBP) or U.S. Citizenship & Immigration Services (USCIS). Federal immigration enforcement vehicles often have the Department of Homeland Security (DHS) logo displayed on the side. See below. Is there a chance the police or immigration officers could come to my house? Yes. However, they must have a warrant signed by a judge to enter your house without your consent. You have every right to ask the officer to present the warrant and to check that the listed address is correct. Even if the officers do have a warrant, you can still exercise your right to remain silent. If you want to carry on a conversation with law enforcement, do so outside your closed front door. Is there really anywhere where I can be safe? What about my children? 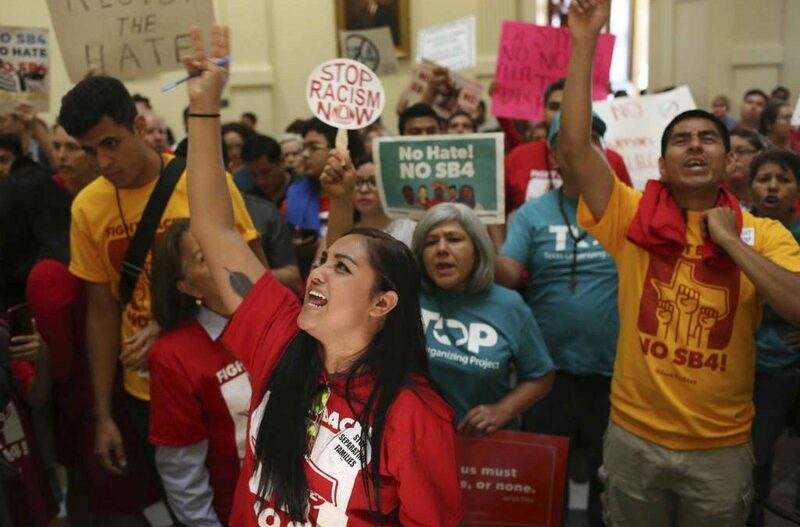 Without a doubt, lawyers and immigration activists will continue to fight against SB4. Regardless of your immigration status, consider joining the fight for immigrant rights. If you have further questions about how SB 4 might affect you or your loved ones, please give me a call.